April 6, 1922 would have been a day like any other, were it not for one of the foundational meetings of 20th century thought then taking place. Normally, when we talk about disputes between heavyweights we think of athletes or popular polemicists of their times. But in this case it was a struggle over the nature and scope – of time itself – that attracted these two heavyweights: the philosopher, Henri Bergson, and Albert Einstein, physicist. The encounter took place during a talk Einstein gave at the prestigious Paris Société française de philosophie. Einstein’s General Theory of Relativity – which posits that space and time affect each other, and that the speed of light will change the conditions of the observation of time for any observer – was being discussed globally, by both advocates and detractors. Bergson, meanwhile, was already a living legend: his work to rediscover the senses of intuition and irrationality, and his own ideas about time were arguably more interesting than those of Einstein, at least from a humanistic perspective. Bergsonian time speaks of a “human” duration to things. These constitute a “vitalist” time in the sense that they mark subjective durations to life. Time is experienced differently at different moments by different people. Beings experience time when they escape the spell of the clock, which can’t measure time in exact terms precisely because it’s already within the duration of time itself. Thus, there is time of learning, of training, of common knowledge, but also there are different times of emotions, time that dissolves while something pleasurable is happening, and time that is restored, monolithic, and heavy when we’re subjected to waiting. While Bergson discredited the infallibility of clocks, Einstein replied by saying that “there is no time of the philosophers” and that all we can do with the tools we have – those of science and rational thought – is to mathematically express the mechanics of time, ridding ourselves once and for all of “vitalist” superstitions and contagious metaphysical moods. All of this remained a matter of debate, and one of these two titans would have to be the winner of the race for time. Einstein, shortly after, was awarded the Nobel Prize in Physics, though not for his Theory of Relativity but for his description of photo-electric effect. This second contribution, while not less than the other, never stirred the imagination of the general public in quite the same way that the idea of ​​time-travel had. Moreover, Bergson remained popular even though later theories about time by the German philosopher, Martin Heidegger, emerged later as the dominant discourse on the topic. A more detailed account of the Einstein-Bergson discussion can be found here. 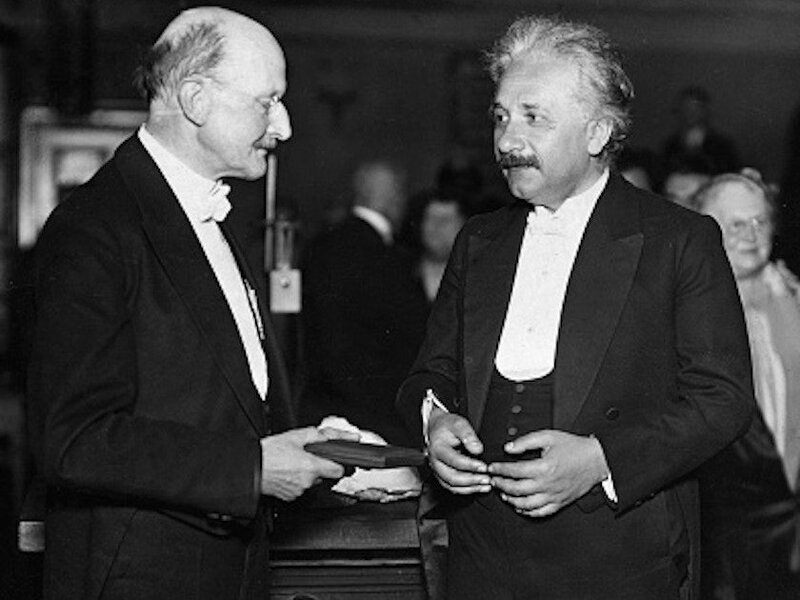 At the Nobel Prize awards ceremony, the jury spokesman said that while the Theory of Relativity was extremely attractive, “It’s no secret that the philosopher Bergson has disputed it in Paris.” For his part, Einstein’s theory on the photo-electric effect never tried to be absolute as had the General Theory of Relativity. The mention of Bergson, by itself, seems to have been a discreet and even an elegant victory for philosopher’s time over physicist’s time: two ideas on the duration and the orbit of human life, on clocks that may or may not have hands.